Happy Holidays from Walt Disney World! Going back though Disney magazines and newsletters, you run into a lot of different things. How Disney handles the holiday season throughout the years through the covers of it’s publications can offer some insight. Disney News was the official magazine for the Magic Kingdom Club. This first image is from the Winter 1972/1973 Winter Edition of the Disney News. It’s a very interesting perspective. Walt Disney World ‘s “Christmas Holiday Parade” is literally fantasy in motion – a moving world of brilliant colors, beautiful music, and famous Disney characters. 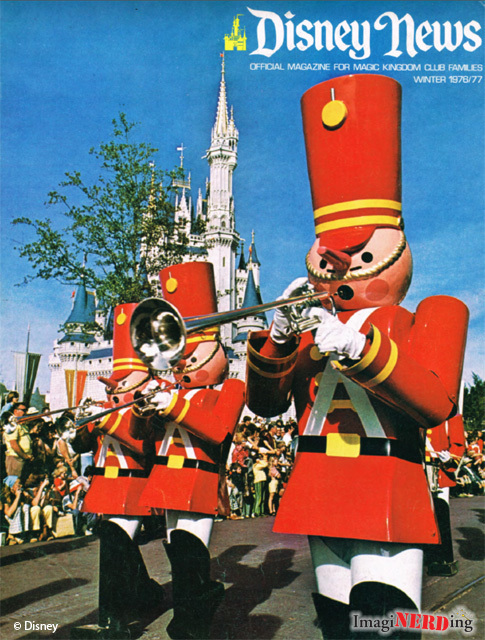 This 1976/1977 cover shows off the Toy Soldiers in front of Cinderella Castle. The holiday season gets an measure of color and gaiety when the Toy Soldiers march in Walt Disney World’s annual Christmas Parade. So, what was the Magic Kingdom Club? Well, it was sort of like a loyalty or reward program that was created in 1957. The Magic Kingdom Club offered discounts to large employers, the military and industries in Souther California. It went nationwide with the opening of Walt Disney World in 1971 and would soon become the largest leisure employee benefit program in the country. It was replaced with the very short-lived Disney Club in 2000. 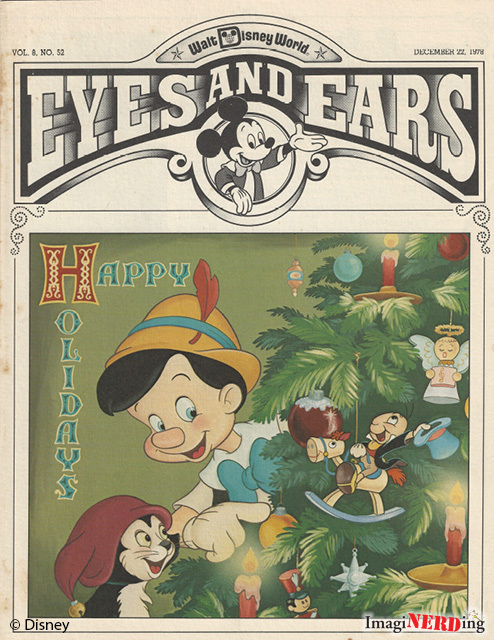 Eyes and Ears is the official cast member publication of Walt Disney World. It’s an amazing research tool. Once you hit the very late 1970s, the production value of the newsletter increased drastically and the covers started having full-color art. 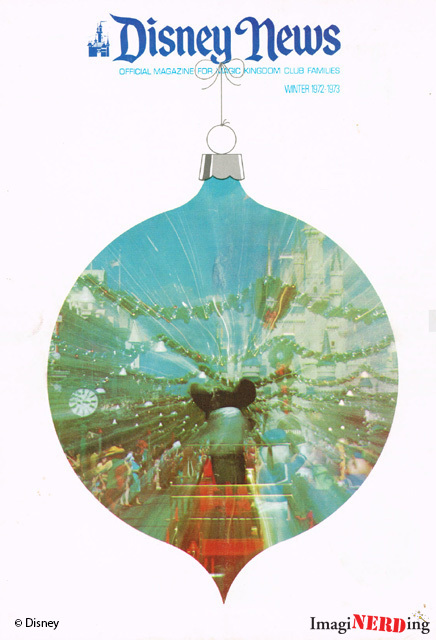 Pinocchio, Figaro and Jiminy Cricket wish us Happy Holidays and grace the December 22, 1978 cover. What could Mickey’s present be? 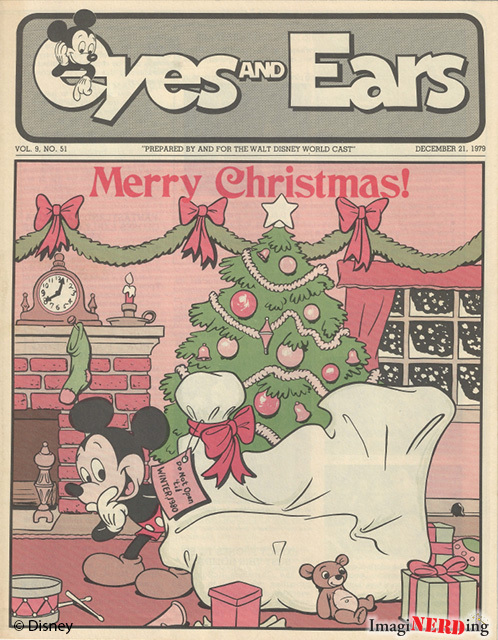 Mickey is waiting on opening a present on the cover of the December 21, 1979 issue. The tag says do not open until Winter 1980. Not to ruin the surprise but this has to be an engine for Big Thunder Mountain Railroad. 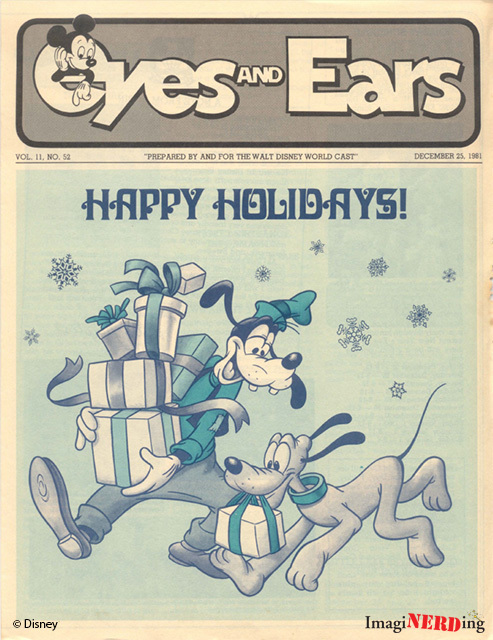 The December 25, 1981 issue has Goofy and Pluto delivering holiday presents. No, I won’t say anything about the discussion about Goofy and Pluto both being dogs.